WITH THE HUNGER GAMES, it seems Hollywood may be reconsidering the treatment of its action heroines on the silver screen. But, on closer inspection, does the franchise offer progress for the representation of women on screen or do generic gender roles still rule the roost in cinema? What was the last action film you remember seeing that featured a relatable and intriguing female heroine? Could it have been Ellen Ripley (Sigourney Weaver) in ALIEN back in 1979? Or perhaps more recently with Sarah Connor (Linda Hamilton) in TERMINATOR 2: JUDGMENT DAY in 1991? It seems that effective female leads in contemporary action cinema have been somewhat of a rarity until relatively recently. This month sees the release of THE HUNGER GAMES: MOCKINGJAY PART I, marking the latest addition to the franchise. THE HUNGER GAMES is an action-adventure science fiction series of films about one young woman’s journey through an oppressive dystopian future America, in which violent survival games are the nation’s favourite pastime entertainment and the country is ruled with an iron fist. Such a setting calls to mind other films with futuristic totalitarian settings such as BLADE RUNNER (1982) or THE RUNNING MAN (1987), both of which feature burly, stoic male characters as leads. Katniss Everdeen (Jennifer Lawrence), a teenage girl, is the unconventional protagonist of THE HUNGER GAMES series who shirks expectation and provides a refreshing change to the conventional gender representations of action cinema. Critics and spectators alike have received THE HUNGER GAMES favourably, praising the film as offering a progressive and pleasant challenge to gender representation in Hollywood. 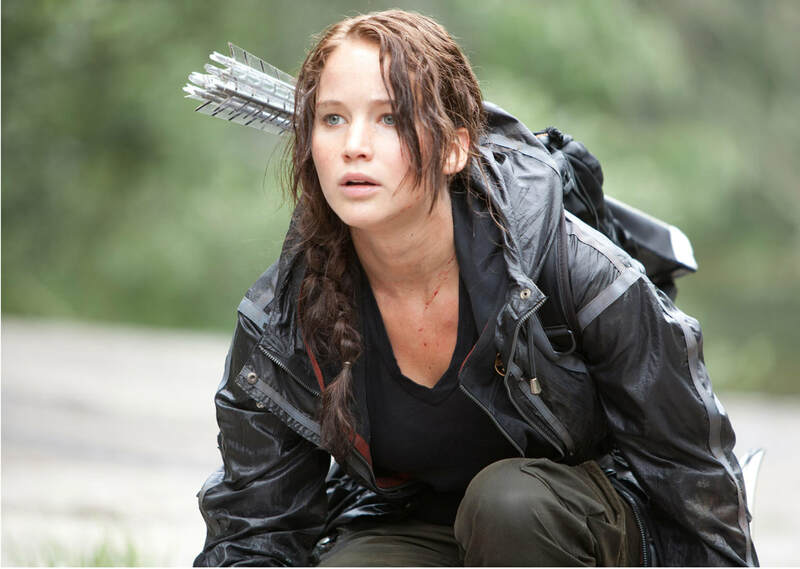 Theorist Jill Dolan explains in her book THE FEMINIST SPECTATOR IN ACTION (2013) that it is “wonderful to watch this girl-hero read the woods … using her bow and arrow to bag food and, in the end, to protect herself and Peeta (Josh Hutcherson) from the remaining tributes.” Dolan continues by praising the mutually beneficial relationship between genders at the heart of the film: “How lovely to see Peeta hang back behind her as they move through the forest, Katniss with an arrow cocked in her bow for their mutual protection.” The male love-interests – Peeta and Gale Hawthorne (Liam Hemsworth) – are physically subordinate to their female counterpart. It is an innovative and welcome sight for a blockbuster. Film theorist Yvonne Tasker sheds some light on this trend in her work SPECTACULAR BODIES (1993) when asserting that the heroines of action cinema tend to be “significant, if passive, narrative figures” that are “fought over rather than fighting, avenged rather than avenging.” The trend of passive female characters in film that are seemingly devoid of any credible ability, physicality or any progressive narrative function is relatively common in the history of Hollywood cinema, especially in the action genre even in recent offerings such as THE AMAZING SPIDER-MAN 2 (2014) or TRANSFORMERS: AGE OF EXTINCTION (2014). Lisa Purse expands on the issue in her 2011 essay “Return of the ‘Angry Woman’: Authenticating Female Physical Action in Contemporary Cinema” and even goes so far as to boldly theorise that “mainstream cinema’s project is typically to explain away, qualify, and often to actively undermine […] female potency as it becomes threatening” usually containing the threat by reinstating “archetypal femininity”. This is referring to patriarchal dominance, the notion that male interests dominate social, economic and cultural conventions of society and is the exact kind of outdated trope that progressive cinema, such as THE HUNGER GAMES franchise, is slowly chipping away at. But, whilst the prominence of THE HUNGER GAMES, or rather its lead actress and character, is a progressive step forward for Hollywood, it is by no means a perfect representation of women. The trope of the sanitised action heroine, whereby the female protagonist amidst the fray of action is incapable of sustaining overt physical injury that might detract from her attractiveness, is applicable to the film series, and to adverse effect. A dirtied appearance would detract from a woman’s beauty and poise, which is supposedly far more important to capture than her diegetic actions. In her analysis of AEON FLUX (2005), Purse examines this phenomenon observing that “Aeon’s face remains undamaged, undirtied, and carefully made up; where injuries do happen they are minor and occur on other parts of the body, such as a shoulder or arm.” We are to assume that this choice was made in order to maintain her physically appealing femininity. A similar effect can be observed in both THE HUNGER GAMES (2012) and THE HUNGER GAMES: CATCHING FIRE (2013) as Katniss carefully avoids messing up Lawrence’s star qualities. Her face retains its delicate softness for the two-and-a-half weeks spent fighting for her life in a forest arena. Even as she unleashes a swarm of tracker jacker wasps on opposing tributes in the first film, despite clearly swatting defensively at her face, Katniss somehow avoids any significant stinging or damage whatsoever. Despite apparently having been stung and poisoned by their venom, we see nothing of the aftermath of these nasty details. During another instance occurring in Suzanne Collins’ original book, Katniss sets off an explosion that bursts her left eardrum, and yet this injury is removed entirely from the film, save for a momentary ringing. This sanitization reveals the film’s interest in maintaining Katniss’s physical attractiveness over any detailed and believable consequence of her actions. There is minimum violence in the original film, happening almost exclusively off-screen and rarely committed by Katniss. Despite the looming threat of bloodshed and constant surrounding conflict, Katniss and Peeta are kept remarkably humane and stray from inflicting pain or violence on the other tributes to reiterate their benevolence. The film shies away from culpable, explicit violence despite its brutal subject matter, most likely in pursuit of a more emotive experience on behalf of its female protagonist. Consequently, it departs from genre convention and its established setting and tone. There are plenty of examples of films that confidently represent women in violent action such as MONSTER (2003) and HARD CANDY (2005). To borrow from Lisa Purse, these films depart from sanitised depictions of femininity and rather offer “an active body that can be experienced by the spectator, [including] its bodily stresses and pain.” The heroine is “untidily angry, bloody, and sweaty, and we are compelled to witness her determination and physical effort.” Arguably, THE HUNGER GAMES made the choice to keep all its violent activity at a distance in order to make the film more appropriate for younger audiences. It is a fair compromise but it nonetheless sanitises a film that markets itself to be more action-orientated and violent that it actually is. Instead of an all-out romantic subplot, it would appear the film trades one cornerstone of archetypal domesticity for another, creating a mother-daughter relationship between Katniss and a young girl named Rue (Amandla Sternberg). Katniss enters a gladiatorial arena in which the skilled marksman must track down and murder other combatants to survive but ends up spending a lengthy duration mothering the 12-year-old girl. Although these scenes are sweet and endearing, they exemplify how THE HUNGER GAMES is unwilling to treat its action heroine with the same consideration of a male hero, and instead finds new situations to domesticate Katniss. This phenomenon explains a tradition where active women are groomed, essentially constructed, by a driving paternalistic force, and turn into wives with motherly qualities by the end of their stories. Lisa Purse also lists an influential and often stubborn father figure is involved in this grooming process, in the case of THE HUNGER GAMES this is echoed in Woody Harrelson’s Haymitch Abernathy. Due to the film’s remarkable love affair with the sanitisation and domesticity of its female lead, THE HUNGER GAMES may not be the perfect landmark representation of the action heroine that the film industry needs. However, it would be amiss to undermine the franchise and decry it as a failure of feminine representation. Katniss remains an exemplary action heroine as a woman uninterested in fame or love over the prize of survival and social reform. She is an admirable template for female representation that Hollywood will hopefully capitalise on in the coming months. With alternate female characters clearly capable of involving themselves in the upcoming fight to liberate Panem, such as Natalie Dormer’s Cressida and Jena Malone’s Joanna Mason, THE HUNGER GAMES represents a brave new shift in gender power in popular American cinema.